We looked blunt. Not surprising given what injury has done to the idea of having a fit and settled 9/10/12/13 unit. Look where Stockdale had to come to get the ball for his try. I don’t think Stockdale ‘had to come to get the ball’, in the senses that starved of possession he came in looking for work, that to me looked a well rehearsed and very effective planned move- and far from blunt. Granted it was the exception, and our sideways trucking of the ball was remiscent of Munster at our worst a few years ago. I’d like to see someone other than Aki tried at 12, as suggested above pairing Farrell and Ringrose at 12,13 would be interesting. That said, we needed a win yesterday, and were solidly the better side and unlikely to drop behind again after the first try, and we did so without 4/5 likely starters. Those injuries, the loss to England, number 2 tag and Joe departing have given us quite a lot to deal with, and Scotland in murrayfield is never easy for us. If you hate that type of reporting then don't read news sites that do that type of reporting. Attention Joe: For video analysis Monday morning - give Earls a pass going forward and your team might be in danger of scoring a try. its a pity that Aki,Kearney and Stockdale dont pass the ball more in general! "Scotland will be kicking themselves this morning. Ireland were there for the taking and they let them off the hook due to their own errors. Scotland had easily as many opportunities as their visitors yesterday. In fact, they probably got across the gain line more often and created more overlaps." More territory, more possession, more clean breaks, more defenders beaten, less missed tackles. I would say we had a better day of things 3 tries to one, missing a few key players and our chief playmaker after 25 mins. Why read the rest of the piece if you can spot a clanger in the first 4 sentences? this not aimed at you TLS, at all! just I find some of the Scottish "analysis" to be of the North Korean propaganda styleee. Andy Nicol, Chris Patterson, McGeechan and most of all Greig Laidlaw having a cut at Poite WHILST STILL ON THE FIELD over the stadium tannoy and BBC. As I said yesterday, glad we have this particular match over, and scotland well beaten up - couldnt happen to a more one eyed and boo worthy bunch. Look what happened to Zebo........... passing the ball is not part of the game plan. Definitely pre planned, yes, and a very good move. It still says a lot that the only hope we have of getting either of our two exceptionally able wingers into space is to run a set play or for one of them to kick it over the top. Set play moves can be brilliantly effective, and Joe has a talent for them. I'd be happier if we allied that with an ability to stretch defences through phases. So you work for the Indo then? The only thing I'm more convinced of now after the Scotland Game is that Carbery should be first choice OH. Sexton would never have made the break or the pass to ears for that try. Totally agree. Also, while Aki has a place in this squad he isn’t a distributor and his partnership with Farrell was marred by their lack of familiarity with each other. Farrell deserves the opportunity to shine. 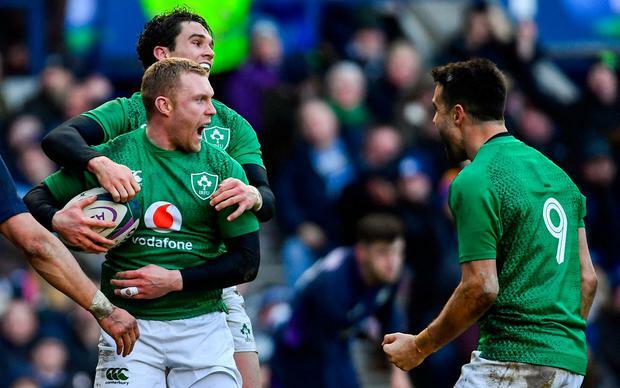 Sexton made two tries in that game the same as Joey the only difference being Sexton got his in 23 mins and ..... both of his were for Ireland. Would you really shoot Your country in the foot by dropping the best player in the world (as decided by some of the greatest players in the game) to give caps to a guy who is from Leinster and only went to Munster a few months ago to further his international ambitions. Last edited by Joe Konys barmy army; 10th-February-2019, 22:42. Resting, Joe, not dropping, resting. Read his post again he said “the only thing I’m more convinced of after the Scotland game is that carbury should be first choice OH”. There’s leinster fans promoting Conan over Stander so maybe it’s an Irish thing. All times are GMT. This page was generated at 18:25.